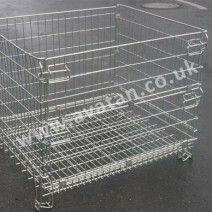 At Avatan Handling Equipment, we pride ourselves on supplying quality metal stillages at affordable prices. We ask our customers to identify what they wish to store in their steel pallets, what weight, how many stillages they wish to stack upon each other, how the metal pallets are to be gated and many, many more questions. We wish to supply rigid and fully collapsible cage pallets, box pallets and post pallets to best suit each individual customer’s requirements. We are often asked for standard sizes and although there are common sizes for stillages, most of our customers have individual ideas about what they want. We manufacture steel pallets from 600mm square to 2.4m square. We offer flat metal pallets (to compete with timber and plastic pallets) and stillages as high as 2.4m high. We can design to suit your own very specific needs. When required, we offer load testing and certification of individual metal pallets and offer crane lift stillages which can be safely and securely lifted by chains and hoists using lifting eyes. 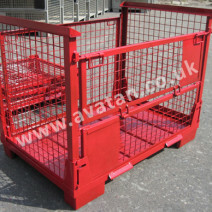 Distribution cages may be fabricated to suit your products or your vehicles with hinging front gates to give easy access to your product and with lockable gates and lid to keep the goods secure. 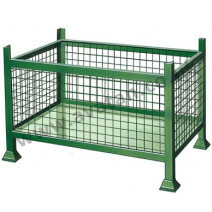 Similarly, forecourt cages are available for gas bottle storage, with optional galvanising to offer long lasting protection to the metal work. Fork guides or fork loops may be added to the underside of our stillages, firstly ensuring accurate and secure handling by forklift truck but additionally enabling the steel pallets to be inverted safely on a rotating fork lift head. 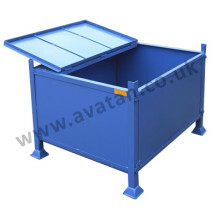 Ideal for waste, environmental reclaim and recycling facilities. At the other end of the spectrum we offer lighter duty post pallets to suit the storage of insulation materials. Insulation pallets again may be manufactured to any size offering an economical and secure medium to store rolls of lighter goods. 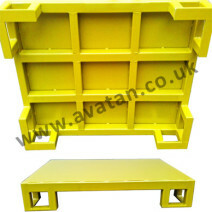 Avatan Postracks, a flexible alternative to conventional pallet racking, are steel post pallets designed to store palletised goods. 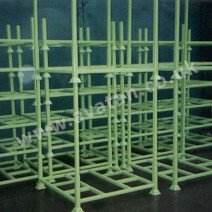 These are available to suit most sizes of pallet and are also available for hire. Long and short term rental terms are available. Postracks may also be used to store rolls of materials, carpet and underlay, or any number of different extruded sections which would lay through the pallet supported by steel posts and overhanging each end. 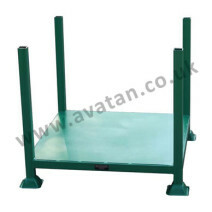 Steel post pallets are available with open braced bases or with flat or chequer plate sheet bases. Whether you are seeking Cargo stillages for airport handling or Scaffolding post pallets for a building site, we are able to design and manufacture a product to suit your specific steel pallet and stillage needs. Whatever your requirement, we will be pleased to help.